Located alongside the harbour excavation of the “Pit of Purification” (dating from the 5th century B.C.) and the necropolis of Rhenia. There is a large collection of vessels especially represented of Cycladic ceramics dating from the Geometric period until the 6th cent. B.C. Also, on exhibit, there are wonderful black and red figure pots and diverse finds, including Hellenistic period gravestones and other sculptures. Among the finds from Mykonos, especially impressive is the “Pithos of Mykonos”: a large jar, (made in a workshop on Tinos the 7th cent. B.C.) richly decorated with zones of bas-relief depicting various scenes from the Trojan War (the central composition shows Achaean warriors with the Trojan Horse). Open 8:30 a.m. to 3:00 p.m., daily except Monday and major public holidays. The Folklore Museum is located in an old, two-storey, captain’s house near the Paraportiani church. There are six main exhibition halls with collections of antique furniture, Byzantine icons, Folklore ceramics, historical commemorative plates, decorative prints and gravures, as well as embroidered and hard-woven fabrics, locks and keys, weights and measures, a collection of model boats and other historical artefacts. There are also import archives of manuscripts and printed material, photographs, maps and a significant library. Open from April to October 4:30 to 8:30 p.m. daily except Sundays. Lena's House is an elegant re-creation of a 19th-century Mykonian residence, close to the Three Wells. It can be visited by prior arrangement. At the Mono Ena gallery and shop in Little Venice, Marina Petri organises readings, cultural events, and exhibitions of contemporary art. Most trevellers tend to leave the cultural life of Mykonos undiscovered - the three Art galleries, The Municipal Library, the Fine Arts School, the four museums. The soul of Mykonos is not so much in the pulsing, labyrinthine cobbled pathways of the main town, but in the island's interior and its villages. The spiritual focal point is the shadowy 18th-century monastery of Panaghia Tourliani. 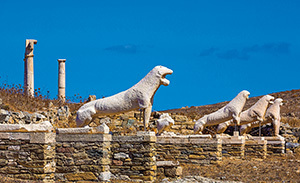 A day-cruise to the archaeological island of Delos island should not be missed.